The first field that will appear is called Extra Items Printers. Verify if a printer is set there. If not, set it to the appropriate kitchen printer(s) you want this information to print at. You may also want to check the Kitchen print options (usually the third field down) to make sure that Notes is selected (please note this is a multi-select field so you will need to hold down Ctrl and click on Notes to add it; otherwise you may overwrite your previous choices and will need to come back to the page without saving). Refresh the Kiosk you are using for your integrations (listed in your EatApp administrative portal, under Settings > Receiving Your Orders > Station ID; you can click on the List Stations button to see the name of the station this is connected to). 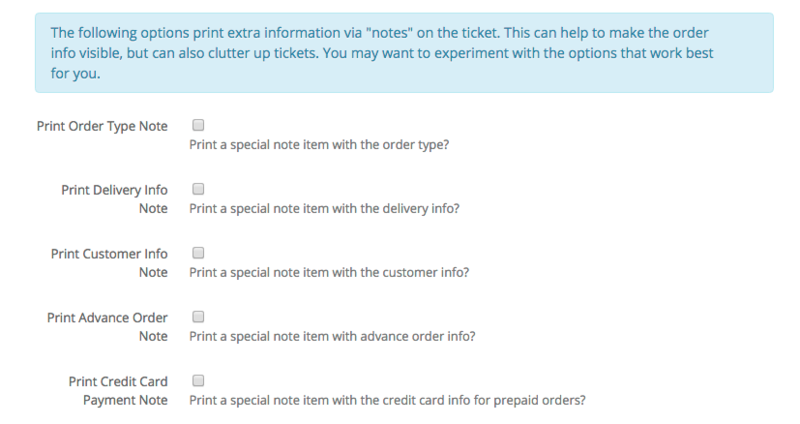 You can now test to see if the information you want to see is printed on the ticket. Carefully select only the items you want to see printed. We would recommend Delivery Info, Customer Info and Advance Order Note. Now you can again test and should be able to see the information you seek on the kitchen ticket.